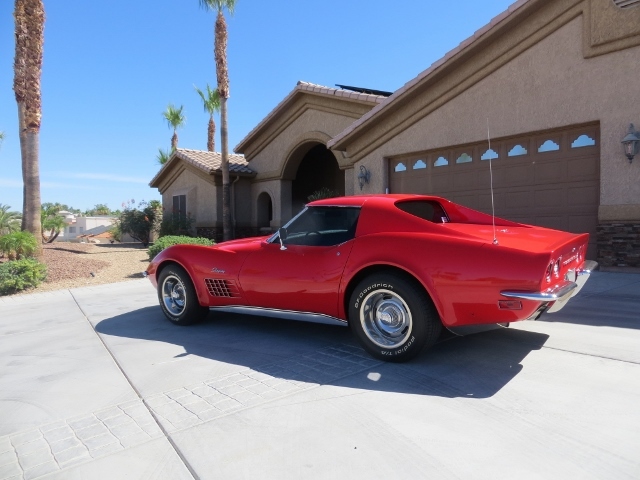 Nice example of an original ( survivor ) numbers matching unmolested 72 Vette T-Top with many factory options including cold A/C, P/S, P/B, 350 / 4 speed transmission,4 whl disc brks, am-fm stereo even factory alarm with a removable rear window and only 80k original miles. Everything works perfect including the headlights and wipers. The paint has some cosmetic touch up but shows beautiful for being completely original! The interior is 100% original and in very nice shape for 46 years old .The chrome is very nice too. The motor was refreshed at 69K miles along with new clutch. The car runs and drives great with good BFG tires on original rally wheels, has spare tire and original jack. Comes with a ton of receipts from previous 3 owners that validates it condition. This is a very solid and nice 46 yr old car with all original body panels which makes for beautiful body lines!